Mount Bazardüzü (Azerbaijani: Bazardüzü dağı, Azerbaijani pronunciation: [bɑzɑrdyˈzy]; Lezgian: КичIен сув [kiˈtʃʼe suv]; Russian: Базардюзю, Russian pronunciation: [bəzərdʲʉˈzʲu]) is a mountain peak in the Greater Caucasus range on the border between Russia and Azerbaijan. At 4,467 metres (14,656 ft) above sea level, it is the highest peak in Azerbaijan and is located in Qusar region. The southernmost point of Russia is located about seven kilometers southwest of the peak. G. P. Baker and G. Yeld were the first men climbing the Mount in 1890 when the first ascent was recorded. Summer is considered the most appropriate period to climb the peak. There are two approaches to the Mount: one from the northeast and another from the southwest. In the northeast climbs can begin from the villages of Khinalig (region of Guba) and Laza (region of Gusar). The southwest approach starts from the regional centre of Gabala - from two villages: one is Laza (the same name with the one in Gusar) and the other one is Gamarvan. 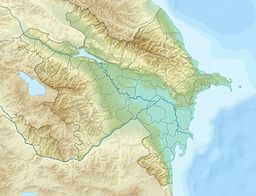 The flood plain of the river Yatukhdara (Yatuxdərə) is the starting point of the summit at 2800 m.
^ a b c "European Russia and the Caucasian States". Peaklist.org. Gora Bazardyuzi. Retrieved 2012-02-01. ^ "Bazarduzu". peakware.com. Retrieved 2018-11-03. ^ "Mount Bazarduzu". www.traildino.com. Retrieved 2017-09-04. Wikimedia Commons has media related to Bazardüzü.